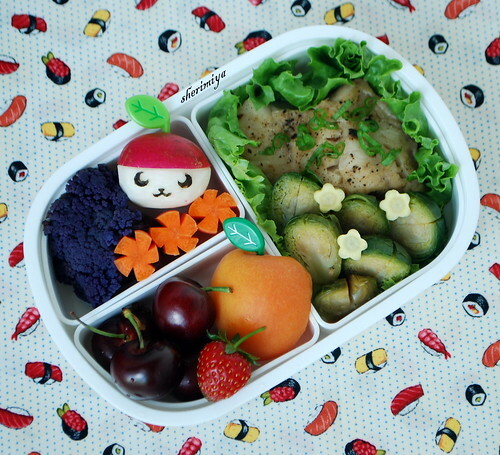 Pandapple Fish Bento, originally uploaded by sherimiya ♥. Today's bento has Chinese style steamed snapper: just salt & pepper the fillet, steam in a little shoyu and mirin to taste until done, 10-15 minutes depending on size of the fish, and top with shredded ginger and green onion and a drizzle of sesame oil. I also steamed the brussels sprouts and cauliflower in the same pan to save time. By the way, the vegetables taste really good in the shoyu mirin sauce too! If you're concerned about the fish taste/smell getting into the rest of the food, you could use a box with a separate tier for the fish. Or, you might be able to simply put another lettuce leaf over to keep it more contained. My boy has never complained, so I just pack it as you see here. I added a few tiny yellow carrot flowers (as usual) for visual interest on the brussels sprouts, and cut a radish into a Pandapple face with nori details. There's also purple cauliflower, raw carrots, a half supersweet apricot, some local cherries and my very own homegrown strawberry. For some reason a whole bunch of them are ripening at a very tiny size; maybe tomorrow I'll cut a whole sprig of them together. They are SO mini and cute. And dark dark red! I ate a few today and they're pretty good! I love the pandapple, too cute! My daughter's still picky about fish, but we're slowly finding new kinds she'll eat. She loves squid though! That is amazing and brilliant!!!! Love the Pandapple so much!! Pandapple... tee hee... you crack me up! Love his little pin-wheels too! Haha! Didn't see the pin-wheels, that's so cute Debra! I love that pandapple! So sweet. so many things here to love, right down to the adorable sushi background!! the fish looks delish (hey that rhymes), you've got every single color in the rainbow here, and the tiny strawberry is 100% squeal-worthy, i still can't believe you grew it, makes me want to run out and find a patch of dirt right this minute! Yet another fervent pandapple fan here, sherimiya! I agree with megan that every aspect of this beautiful bento is a lovable delight! Your fish recipes are always outstanding! Thanks megan! Yep, the teeny strawb is the cutest, I could barely stand it myself! And I forgot I had this cute mini sushi fabric, it was supposed to be for a baby outfit. I hope you do get a patch of dirt; I would love to see you grow something too, hehe! Thanks Susan, yeah us too! Yummy! Yes, they grew so well this year so far, so happy! I hope you can grow some too!